Song lyrics in original Finnish & Swedish and in English translation. 2017 marks the centenary of Finland’s independence. This 5 CD collection encompasses works by native composers from 1917 to the present and reflects the flourishing talent, artistry and experimentation of Finland’s classical music scene. These compositions are imbued with the beauty and isolation of the Finnish landscape, while capturing the nuance and personality of each composer. 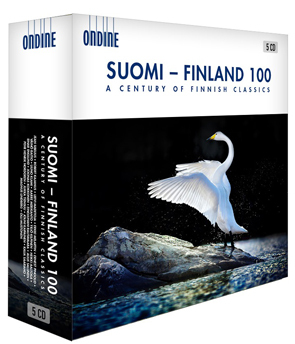 This anthology features Finnish artists from the Ondine catalogue, including some of the most prestigious orchestras, singers and instrumentalists of the country.